Wave 1 is always a 5 wave structure.. It almost always is composed of impulse and corrective waves with an internal wave counts of 5-3-5-3-5. Very rarely will it be a leading diagonal with an internal wave structure of 3,3,3,3,3. Even as a leading diagonal, it still has 5 internal waves, but all of the internal waves including waves 1,3, and 5 are broken into 3 wave a,b,c structures. Note that in the above impulse diagram, the smaller waves break down into yet another identical wave structure, as opposed to 3 wave structures shown for the diagonal. Simply put, the black waves 1 and 2 on the impulse chart will look like a miniature version of the blue waves 1 and 2 on that chart with the same 5-3-5-3-5-a-b-c internal structure. As is more frequently stated, impulse waves are fractal in nature. If you would like to know more, take a look at the discussion of fractal waves at StockCharts.com. Confirmation always requires movement beyond prior pivots. At times, the expected Wave one will quickly retest the wave 5 pivot. This is generally true on shorter term intraday charts. This retest is actually wave 2 of a smaller degree, but can serve as initial confirmation that Wave 1 is in progress. Using this as a basis for trading is beneficial in three respects. First, the wave 5 pivot where you put your stop loss is substantially closer. If your wave count is wrong, you can limit yourself to a much smaller loss. Second, if you buy after crossing the wave B pivot (our second method of confirmation) you run the risk of a significant draw down if the wave 2 does a deep retracement. It is much more likely there will be angst, even if your wave count is right. And if it is wrong, you stand to lose a lot more money. Finally, wave 1 may develop in such a way that you are comfortable taking profit at the wave 1 pivot, but would not be be in a position to do so if you had entered the trade at the wave B pivot. That is, it is much easier to take profit, sit out the wave 2, and reenter the trade at a much better price. From a strictly Elliott Wave perspective, confirmation that Wave 1 is in progress occurs after clearing Wave B of the prior correction. However, we like the failed new low / failed new high approach much better. Wave C.5 might not be finished. Wave 5 could be extending. 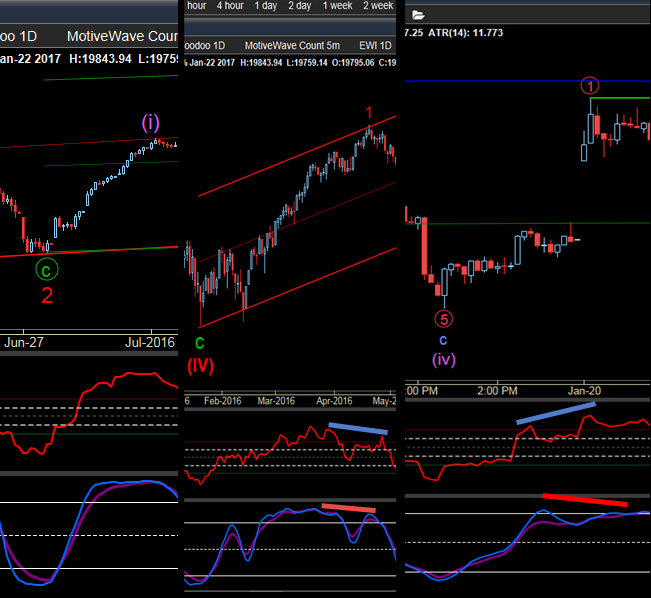 You could be in an X Wave of a complex correction. This will first become obvious when W1.4 overlaps W1.1 and violates the rule against a wave 4 overlap. When this happens, you may be tempted to declare the structure as a Leading Diagonal. The odds are so greatly against this (except for indexes and commodities) that you should refuse to consider it. It is far more likely to be a wave X. If Wave b.4 is beyond the wave 3 pivot (expanded flat), you could have a triangle forming in wave 4, therefore use the Wave 4 pivot. Cardinal rule number 1 for trading wave 1 (and any other impulse wave for that matter) is to be certain that you have a reasonable expectation that the prior correction has ended. Take your chart down to a lower time frame. Does the corrective wave structure count right? Have you taken into account any extensions that developed in wave C? Does the entire corrective wave adequately retrace the previous impulse structure? Does the correction have "the right look?" The common advice given for trading wave 1 is that you should treat it as if it is still part of the prior corrective wave until such time as it rises above the prior wave b.4 pivot. View it as an X wave (or if you are in wave 5.1, as a part of a prior wave 4 triangle) until it clearly demonstrates to be a wave 1 (crosses the wave B pivot). That does NOT mean you need to wait for price to cross the Wave b.4 pivot before entering a trade, just that you need to be mindful that the correction might still be in progress. Despite the fact you are confident, identify what price action will prove you wrong. With wave 1, that typically means price moves beyond the wave 5 pivot. The more conservative trading approach is to actually wait for price to cross the prior wave B corrective pivot before entering a trade. The more aggressive trading approach is to enter the trade after the failed new low/high is confirmed. For the reasons discussed above, we favor that approach. Stop Loss - people frequently suggest placing a stop loss one tick immediately beyond what you think is the wave 5 pivot. While this technically is correct since you were clearly wrong in your wave count, we have found this to be a serious mistake. We can't tell you the number of times the market has moved beyond the pivot a few ticks only to reverse and head in the opposite direction. The better approach is to give the market a little leeway to create a new low. 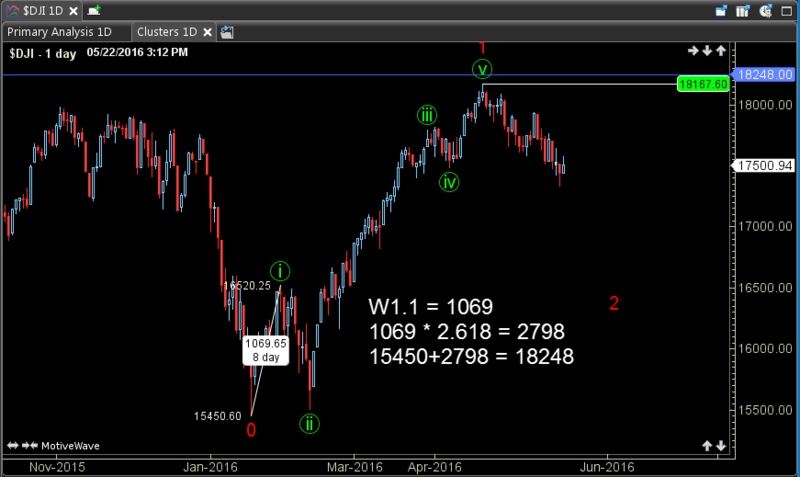 Yes, you are wrong in your wave count, but you might still be able to salvage the trade. Even more importantly, if you are watching the price move against you in real time, you are better to cancel your stop loss and watch the price action. Market makers will frequently clear the stops before reversing the price, but if your 5 or 10 tick stop still appears to be low hanging fruit for them, they will go get it. Instead wait for price to reach your exit point and execute a market sell if price doesn't reverse pretty quickly. With this advice, you must still be willing to pull the trigger and close the trade if price does not IMMEDIATELY reverse course. Discipline is important. Do not be temped to give it a few more ticks to see if it changes, it won't and you'll find yourself way under water in no time. Finally, even if price does reverse course, put your new stop loss right where you were going to put it to begin with, not beyond the new pivot. All you are really trying to accomplish is to remove the low hanging fruit, not alter your original trade plan. Wave 1 is difficult to predict in both price and time. As a general rule, you can expect wave 1.1 to reach the pivot of wave 3 in the preceeding wave C. In a clean formation, the W1 target can be estimated once W1.1 is finished. Since we know the expected W1.2 retracement (.618), the presumed length of W1.3 (1.618), the expected retracement of W1.4 (.382) and that W1.5 is expected to be equal to W1.1, thee W1.1 pivot should be approximately .382 of the total length of the wave. Therefore, an estimate can be made that the total length of W1 will be 2.618 times the distance of W1.1. An impulse, wave 1 is the least common extended wave EXCEPT when it is wave 1 of a larger degree wave 1. 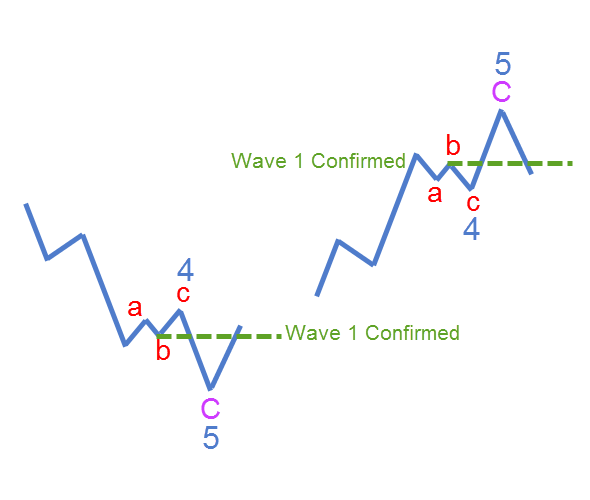 With larger degree 1st waves (Intermediate and above), it is common for Wave 1.1 to extend. Be sure to review our Introduction to using TA Indicators with Elliott Waves..
Expect some divergence --- During wave 1, indicators will typically run from the oversold/overbought position all the way to the reversal zone position. As shown in the three bullish charts below, the indicators move from the oversold position up into the overbought zone. Note the divergence seen in the couple of the charts. This is the typical due to the internal wave 5 within wave 1 and can be telltale sign that wave 1 is coming to an end. That is, indicators tend to peak at the wave 3 pivot, draw back during wave 4 and continue to draw back (or level out) despite the price advancing in wave 5.